You can almost smell the beer and frieten now. This weekend sees the start of the cobbled classics. I’ll do a preview for the weekend’s double bill of the Omloop Het Nieuwsblad and Kuurne-Brussel-Kuurne but ahead of these it’s worth noting and celebrating the start of the spring classics season. Yesterday Tom Boonen was photographed wheeling a suitcase across a car park. So what? Well that’s the point, a man with a suitcase is newsworthy because he’s a pro cyclist and the classics are starting. And when Boonen rode the course with his team mates this training session was itself a media event with photographers out to record the moment. For me the classics season are a fourth grand tour. Just as the national tours of France, Italy and Spain might venture beyond national borders, the spring classics are mostly Belgian but include excursions into France and the Netherlands. Of course there’s no overall classification, this is not a grand tour in a literal sense. But there are flat stages, transition races and mountain stages; the Belgian Ardennes might not seem Alpine but there are as many vertical metres in Liège-Bastogne-Liège as a mountain stage of the Tour. There’s something for everyone, for the sprinter and the climber alike. What I also like with a grand tour is that you get stories and plots. In a normal one day race the riders appear the night before, race and then go home; the same for the media. But with the spring classics season riders and journos alike base themselves in Belgium and there are stories and narratives that run and run for weeks. A new talent can emerge, another is trying to overcome injury or perhaps a team is feeling the pressure. Take last year when after the Omloop-KBK weekend the Belgian media were already raising questions about BMC. It seemed premature but with hindsight they were right. It can get excessive, for example Sep Vanmarcke’s girlfriend became public property after his win last year. But often the coverage is excellent with plenty of analysis and commentary in the press and on TV, you get a lot more than the top-10 finishers. Either way there are stories and tales that will develop and unravel over the coming weeks. And better than a formal grand tour, riders can crash out with injury but battle back to race the next week or even month. The next two months are also a celebration of Belgian cycling. No other country likes cyclesport as much – the inflight magazine to Brussels includes ads featuring pro riders. The racing is also spectator-friendly with circuits a communal event too. When there’s a race on it becomes an event, people gather, food appears and the public is often knowledgeable… when sober. Cycling allows spectators to get close to the action and competitors and sometimes the proximity is alarming, riders at peak fitness pass fans with a can of beer in one hand and a cone of fries in the other. Of course this does not mean the whole nation is cycle-crazy but you won’t find another country in the world where the sport is celebrated as much. It’s hard to explain why the sport is so popular, perhaps success just breeds success? There are structural aspects like a rich network of clubs and many local races to support the grass roots. Geography and sociology play their part, a dense population where riding by bike was long the way to get to the field or factory. Welcome to Belgium where even training rides are considered newsworthy. No other country celebrates racing as much. If France welcomes le Tour each July but shrugs indifferently at the sport for the rest of the year. From now until late April is the spring classics season. The sport and its coverage goes up a level this weekend. This can be enjoyed by fans around the world but you have to visit Belgium one day to see, smell and taste it for yourself. Although I will, going forward, forever call the spring classics the fourth tour (thanks! ), the reason I enjoy the classics more than I enjoy grand tours is that the riders are generally going all out like there is no tomorrow to worry about. No energy that needs to be saved. Sure, Tomeke will target Flanders over OHN, but if he smells blood, he will go for it with abandon! I can smell the frieten and spilt Bier from Little Rock! Yes, fixed. There’s no leaders jersey either but Boonen’s Belgian stripes are the next best thing. “He looked me in the eye and he said ‘Man, I’ve looked death in the face and I am the fourth Grand Tour'”. With all due respect to Tours Down Under, Qatar, Oman and the others, this is the REAL start of the season. Great article. I especially like the fourth grand tour angle! Thanks for the nice bit. I share your enthusiasm and will see my 4th of the 5 monuments this year with Tour of Flanders, but not before heading over to the center of Italy for Strade Bianche and the revived Giro di Lazio (now Roma Maxima) for a great prelude to the Belgian Classics. Might have to agree with you about Belgium and cycling mania…but throw in the food and I’ll take Italia any day! You can eat well in Belgium too but it’s winter food like sausage, meat and potato washed down with beer. 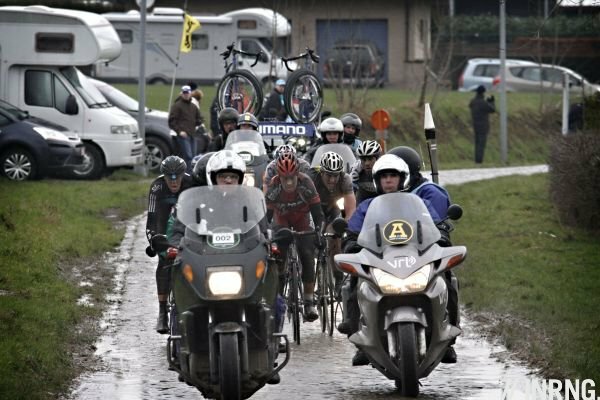 The racing cyclist watching their power-weight ratio is probably better off in Italy. Beer, even high-grade Trappist beer, is usually more diet-friendly than big red wines (at least in the amounts I find most enjoyable). Who said ANYTHING about healthy or power-to-weight ratios? I’m just talking about eating properly cooked pasta, great wine, cheese, bread, fresh vegetables and the like. Especially difficult to go to a place like Belgium when you’re fortunate enough to be spending the winter enjoying all that in Sicily. I had pretty much enough Belgian food last year when we went up to see Paris-Roubaix…other than the beer and frites I’m NOT going up there for the food, rest assured. Belgian food is awesome! I guess it comes down to how much money you want to spend and if you get stuck at touristy places, but we have really good restaurants! Guess you just had some bad luck when you went to Belgium. You can’t compare italian and belgian food. But rest assured, Belgium has lots to offer, from Waterzooi (delicious soup)over Asperges op zijn Vlaams to moules frites, belgian waffles and finally the great chcolate candies/pralines. Supermarktes are far better stocked than here in Germany and generally food is considered to be an important issue for belgians. Yes, let’s get it started! They expect cold, freezing temperatures on Saturday (cloudy but dry), and even some slight snow on Sunday. Real weather for “Flandriens”! The picture in this article brings to mind a question I’ve had many times. What’s it like for a cyclist having to breathe all the exhaust fumes of the motorcycles and car train surrounding them while they ride? Almost like having your own portable Tour of Beijing. Probably not nearly as bad as a ride through any town, city, or even busy country road. It depends on the circumstances but often the vehicles have to a certain distance ahead. It can be worse in the mountains when cars and motorbikes are going uphill on a hot day and allowed to stay close to the race because there’s little drafting effect. Can anyone recommend either good TV or internet viewing for the spring classics for the deprived cycling fans in California, USA? Or torrents if you want better quality and/or can’t watch it live. Or Eurosport player if you have the money, though not sure if you can watch cycling on demand or if it’s only live. If you ever want and go watch a cycling race live, don´t go to the Tour de France or the Giro. Go to the Tour of Flanders. Enough said. The country stands still that day, its a national holiday. I would NEVER tell someone not to see any big time race in person if they have the chance, especially the Giro, but I might agree more with you that the Ronde is the one to see FIRST once I see it myself 🙂 For some stupid reason I’ve let the tour organizer talk me into riding a bike in the citizen (or should that be idiot?) event the previous day, so the whole experience may be tempered a bit, along with my arse! Larry – I rode the Ronde a couple of years ago for Road.CC. It was absolutely brutal! Write-up is here to let you know what you’re in for. And yes, I’m dying to go back! Larry – I’ve twice ridden the cyclosportif and then watched the race the following day, including last year on the new course. That is absolutely the way to do it, and you’ll gain even more appreciation for the PROs having just ridden the course yourself. Contrary to Rob’s experience, while difficult (the jar of the cobbles definitely takes some getting used to), I think the weather has as much to do with your experience as the course itself. The first time I rode it in 2010, it rained intermittently throughout, and therefore the climbs, already teaming with other cyclists and very slick cobbles, foiled many of my climbing attempts (once you unclip, that’s often it). Last year the day was cool and overcast, but dry, and I made it up everyone of the muurs. Both times were thoroughly enjoyable though. This is the best time of year, Spring, the promise of what may flower. I get fed up of Tour, Tour Tour. I second Matt’s comments, above – the one day classics seem so long, hard,tough, and, by definition, are “one race- one day -one shot” events. Let the matches be burned! The Grand Tours have their own charm, of course, but the one day classics seem, to this deprived cycling fan across the pond, as though they require a certain tenacity and will of a different sort from the perhaps more calculating (though super difficult in and of themselves) demands of the stage races. I can’t speak to the cuisine of that cycling country, but the bier is of superior quality. Hat so off to France they win hands down on the cuisine front. Oh the bread! us hogging the road. They either understand our need for speed, or are overtly polite! to getting our short-finger-gloves-and-bib-short-thang on!!! As for being ‘flandriens’, you just adapt to the environment, become part of the furniture! And have a distorted need for speed!!! I eagerly look forward to the weekend. The Belgian cobbles have special romantic feel about them with so much history. Also, I hope Thor nails down “l’enfer du Nord” this year. Classics over Grand Tours for me too!! first visit to the Tour of Flanders last year, going back again this year. The race goes past the same spots on the cobbles three times, so great value for the trip from here in Devon. Loved the atmosphere. In UK races most spectators are health freaks, but in Belgian they’re all in leather jackets and smoking. Bring a crate of beer and make sure it’s all gone by the time the race arrives so you can stand on the crate. Previous post: Should Performance-Enhancing Drugs be Legalised?